Renovation work is underway on the second floor of 42 N. Sandusky St. in downtown Delaware — the future site of Bolton Insurance Agency — following the approval of a Community Reinvestment Area (CRA) agreement between the city and building owner KB42 LTD. 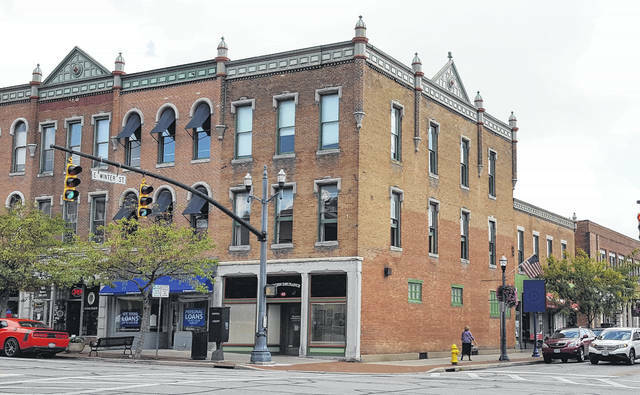 Under the agreement, KB42 will receive a 15-year, 100 percent CRA tax abatement on an $80,000 investment toward the renovation of the second floor of 42 N. Sandusky St.
KB42, which is owned by Dennis Bolton and Kreg King, will see a tax savings of roughly $30,000 under the 15-year agreement. In return, within the next three years, the company has committed to hiring 10 full-time employees with a total annual payroll of $600,000. Bolton, whose company owns two other downtown properties — 38 and 40 S. Sandusky St. — said he couldn’t think of a better location for Bolton Insurance than downtown Delaware. “We are excited about being part of Delaware and bringing our business here,” he said. Along with the CRA agreement, the ordinance approved by council also contains a School Compensation Agreement in which KB42 will pay the Delaware City School District $463.42 and pay the Delaware Area Career Center $19.66 a year over a 15-year period beginning in 2019. • Council on Monday heard a third reading on the proposed “tether” ordinance, which seeks to amend the neglect of companion animals section of the animal and fowl chapter of the city’s codified ordinances. A public hearing on the matter is scheduled for 7:25 p.m. on Oct. 23 in council chambers. • Approved a resolution authorizing City Manager R. Thomas Homan to enter into an agreement with the Ohio Department of Transportation for the resurfacing of portions of U.S. Route 42 between U.S. Route 36 and Horseshoe Road was approved by council. The city’s estimated share of the project — expected to take place in summer 2018 — is $89,000. • Mayor Carolyn Kay Riggle read proclamations recognizing both Oakland Nursery’s Melissa Bargar for helping in the beautification of downtown Delaware, and David Wortz, of Boy Scout Troop No. 318, for achieving the rank of Eagle Scout. • Council established a public hearing for 7:45 p.m. on Oct. 23 in council chambers to consider three ordinances pertaining to the proposed construction of Fire Station 304 on 4.102 acres located at the northwest corner of the Cheshire Road/Glenn Parkway roundabout.